Continued from last time, Club Capcom Magazine delves into the hidden past and unseen future of Rockman X. Behind the Birth of “Rockman X”! How is this connected to Rockman? The new “Rockman X” is, to put it simply, a game that is set in the same world as the “Rockman” that appears on the Famicom. Only, the “Rockman” time period is set in 20XX A.D., while “Rockman X” takes place in 21XX. That is, “X” is set in a slightly later era. 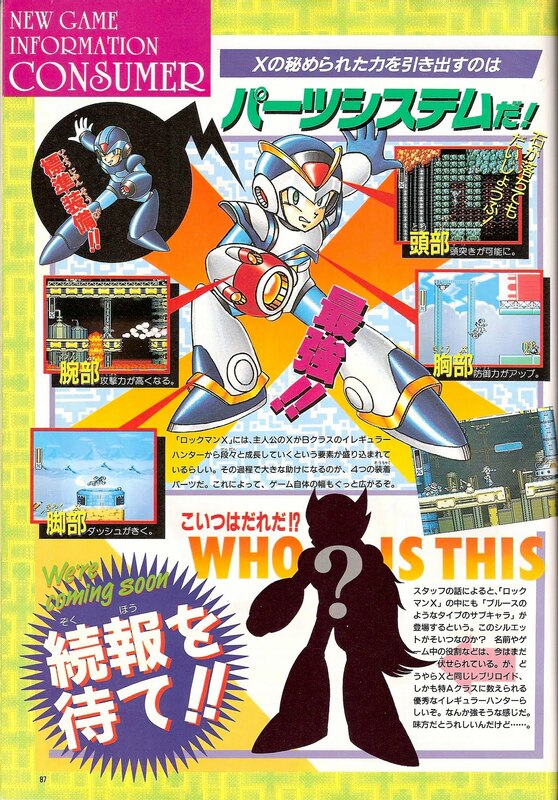 Our protagonist this time is X, who is of course an entirely different person from Rockman. He’ll still have the Rockbuster on his left hand, the helmet, and everything that’s come to be associated with Rockman, but he is in fact a separate character. He is merely inheriting the world stage of the “Rockman” series, and that means the same familiar types of enemy characters will be around as well. Please think of this as new series set further along in the same universe. What is the game’s setting like? In this game, Dr. Right has already become a historic figure, known as the “Father of Robotics”. In short, X is the robot magnum opus created by Dr. Right. By progressing the science and technology of Rockman and his fellow robots, this vastly improved robot is the pinnacle of Dr. Right’s work. He is called a “Repliroid”, a robot with complete human cognition, and his duty is to protect the social order as an “Irregular Hunter”. In their era, there is equality between humans and robots, who live in mutual cooperation with one another. Will this game be like “Rockman”? Of course, and that’s why we used the “Rockman” name. The action will be a little different than the Famicom series though. For example “sliding” is gone, but we’ve added other moves like the “triangluar kick” to make up for it. In addition, this time there will be a new special feature called “Robot Operation”. 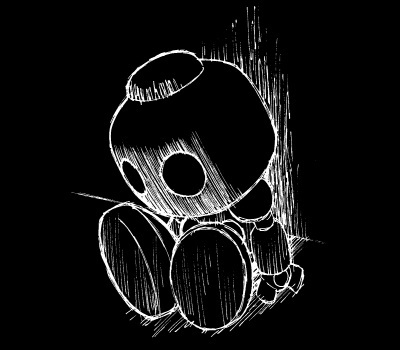 In a certain portion of the game, you’ll be able to obtain a robot that you can ride in to progress within the level. Naturally, the system of obtaining special weapons from the boss enemies you defeat is well in place, and there will even be a Blues-type sub-character who makes an appearance. What degree of difficulty will this game have? Hmm, that’s a rather difficult question, since the difficulty is selectable with this new system. The members of the Irregular Hunter organization to which X belongs are divided according to their abilities into 4 ranks, from C, B, A, to the highest category which only 0.01% belong, “Special A”. X was enrolled as B rank. However, X has some concealed abilities that he himself does not yet know about, and as the game progresses he can discover these powers and grow stronger. It’s dependent upon the player how much X develops, making it possible to decide which powers and techniques X gains to suit your own taste. It’s all entirely up to the player, a feature which we hope you’ll all enjoy. Just like you’d expect on the Super Famicom, these bosses are BIG! You’ll even find amazingly huge mid-bosses along the way as well… “To stand out a little from the Rockman series, we tried to incorporate more stylish and frightening designs than ever before,” the Staff told us. No need to fear the falling rocks with this! Grants the power to Dash! 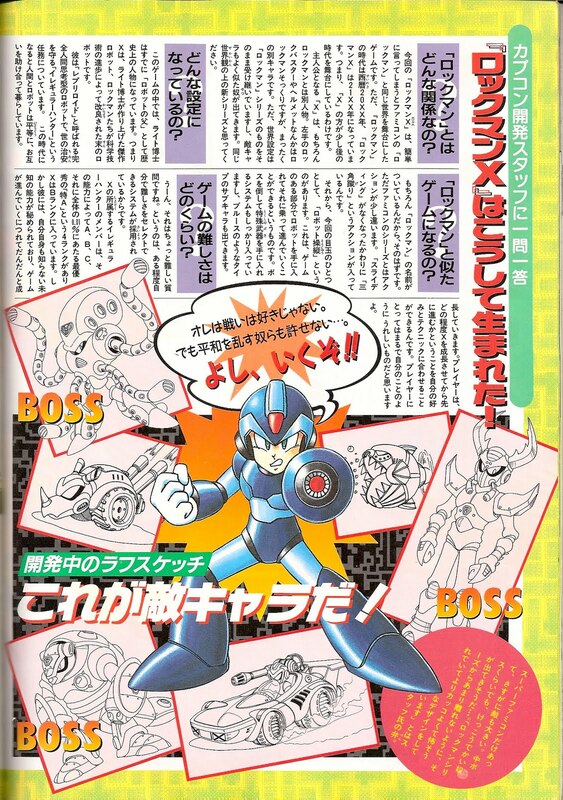 In “Rockman X”, they’ve incorporated a feature where our hero X begins as a B class Irregular Hunter and grows step by step, maturing and improving. Helping that process along immensely are the 4 equippable parts. With these, the depth of the game vastly increases! 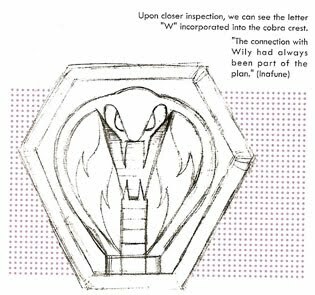 There’s so much detail to take in on page 86, I recommend you have your Mega Man X Official Complete Works book handy for comparisons. Though some more than others, every enemy shown there is different than what appears in the final game. Marking the two extremes, the Roader enemy to the left of X is completely different than the ones that appear in X1 and X2. Meanwhile, to X’s right, the Gulpfer fish robot has barely changed at all, only minor detailing around the fins would be changed. Below X, an early version of the Road Attacker sports a different driver, a rear-mounted cannon, smokescreen tires, a rear spoiler, and no spikes on the front bumper. And how about those bosses! Each one slightly different than the final. Octopuld has ornate gears on his shoulder armor instead of torpedoes. Armage is drawn with a buster cannon on his arm. Kuwanger is missing the wings on his back and sports a sharp-tipped hand gauntlet instead. And upon all three, you’ll find a cobra symbol instead of Sigma’s wolf-like one. From page 94 of the Mega Man X Official Complete Works. Implicit within this symbol lies a mystery. In what way might the Irregulars have been related to Dr. Wily in the concept phase? And upon the next page, a silhouette of Zero that is slightly off. Did you notice? Zero’s buster is shaped more like X’s default one, smooth with an elongated barrel muzzle. We also have another handful of screen captures. There are a few off details, like in the screen of Chameleao’s level showing off the headbutt. A pretty interesting preview, indeed! And to think, they had answered the hotly debated question of whether or not X was the same character as the original Rockman, before the game was even out! But that article hardly slowed the slew of fan speculation surrounding their connection, in Japan or any other region. 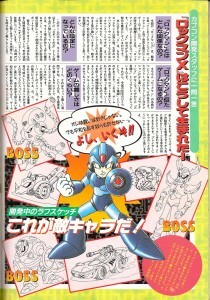 The next issue of Club Capcom covered more of the X story and characters, featuring Zero and Sigma. However, due to the bi-yearly publication schedule, the game itself had already been on sale for quite a while by the time the next issue arrived, making it more of a recap. I’ll probably put it up sometime anyway. 4 Comments to "Rockman X: Origins"
"[…] but he is in fact a separate character." I don't think it was ever really a mystery, as Inafune himself had already stated that they were separate characters in an interview once. Plus, there really is overwhelming evidence that they are, in fact, separate characters. Still, it would have been nice if this info had been widely available when the X series first debuted in North America. From the looks of things in past blog posts, it seems that even magazine publishers that had "inside information" weren't aware of this fact, either. Then again… even nowadays, American gaming magazines are full of misinformation regarding the storylines of games, so, oh well. @Clown Prince: Even with the evidence, it seems that fans can't agree about Megaman being X or not. I always figured that they were separate characters, myself. OMG, I wish that seperate person comment was known 10 years ago. Those debates really killed my interest in the X series. Why was Capcom so cagey about it for so long if they just outright said it here? Geez. « Happy Day of Sigma?